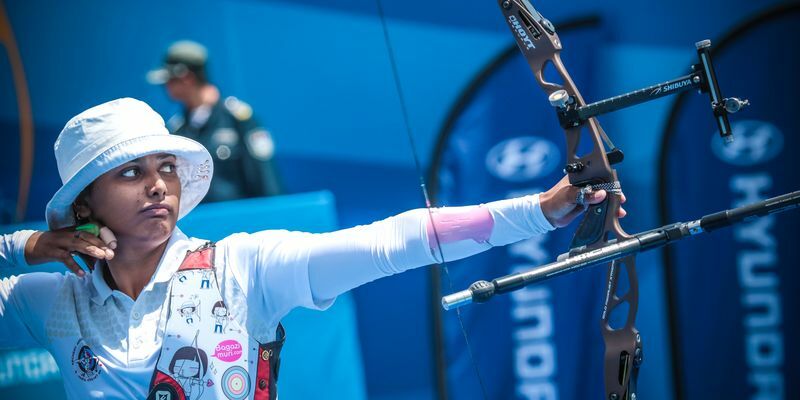 India's star archer Deepika Kumari has bowed out in the quarter-final of the Archery World Cup finals going down 0-6 to Tan Ya-Ting of Chinese Taipei on Sunday. The sixth-seeded Indian failed to offer much of a challenge to the higher ranked Ya-Ting despite winning 27 shots in the first set. The World No. 12 was able to make 27 shots in the initial set, however, wasn’t able to be consistent. On the other hand, her opponent Tan Ya-Ting of Chinese Taipei completed with 29 shots. Moreover, the disparity was intensified in the second set when Ya-Ting finished with 30 shots to Deepika’s 25. Kumari could not offer much of a challenge to higher ranked Ya-Ting, even after putting on a better game in the third set, the score was 28-27. As a result, the 23-year-old bowed out in the quarter-final of the Archery World Cup Finals. Deepika qualified for the tournament after a strong and steady season, in which she attained the second-highest average match play arrow among the eight recurve women that had qualified for the Finals. Kumari has finished second at the World Cup Finals four times earlier and this was her sixth appearance at the tournament.